Mike and Tanya Sharp, recent arrivals in Albion, announced the opening of Sharp Plumbing and Repair, LLC, effective June 1, 2015. The Sharps have been Albion residents since late January. Tanya is the chief financial officer at Boone County Health Center. 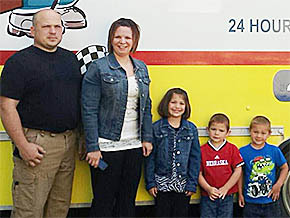 Mike and Tanya are the parents of a daughter, Dayna, eight, and two sons, Austin, four, and Carter, three. Mike has been employed in the plumbing business for the past 15 years and most recently has been working for a plumbing company in Central City.